Acrylic flesh Tunnels and plugs are affortable, lightweight and very robust. These characteristics make them perfectly suitable tu use as tunnel jewelry that is daily worn. Plastic flesh tunnels are available in an enormous amount of different colours, shapes, sizes and with amazing motifs. To make acrylic tunnels and plugs even more attractive we offer you the latest piercing trends and update our portfolio on a regulary basis. Although like with almost any other tunnel material the most popular colours are black and white the different brightly shining colours have become a lot trendier. We offer rich grass green tunnels in sizes between 2mm and 25 millimeters. As green is the colour of hope you can be sure that people will recognize you in a positive way when you wear these tunnels. The definitely have a strong flirt factor and will make you even more attractive. A bit less conspicuous but also very trendy are the transparent acrylic ear tunnels. They will make your stretched ear lobe piercing even look a bit bigger. Like the green plastci tunnels the transparent ones are also available in sizes between 2 and 25mm. Baby blue acrylic tunnels have been a huge trend within the last months. We offer them from 2 to 16 millimeters so don´t stretch your ear lobe piercing too far. :-) This also applies to blue, purple, pink and yellow acrylic tunnel jewelry. Of course most tunnels and plugs for stretched ear lobe piercings are in the shape of a circle. But why not trying something else from time to time. For this you can buy heartshaped, triangular or star-shaped tunnels made of acrylic here in our tunnel shop as well. These are a true eye catcher and offer you a welcome change in your tunnel jewelry habits. If you want something else that is remarkable or acrylic flesh tunnels gemmed with strass are the perfect alternative. They are very robust and look beautiful not only when the sun is shining on gemstones. An ultimate trend at the moment are pearl colours. This means that the classic colours white, grey, orange, pink, red, blue or anything else are combined with some kind of metallic look like you know it from pearl jewelry. This is very bautiful and in the same way really unique. 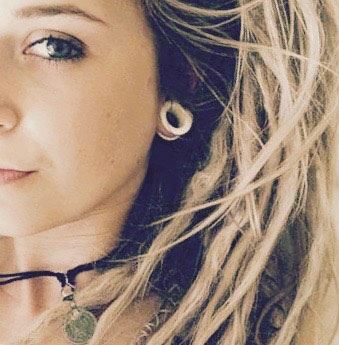 The most popular ones are the pearl grey / anthracite tunnels. These are available in sizes from 3mm to 12mm. Also very stylish are the pearl green acrylic tunnels, the pearl purple and pearl pink ones. And of course you can also buy the alltime classic not only for your teeth here - the pearl white plastic tunnels. Aside the classic black or silver flesh tunnels that belong to the absolute basics of nowadays piercing culture, brightly coloured flesh tunnels made from synthetics like acrylic are the stars of this section. As well as tunnels made from steel or titan, acrylic tunnels mostly comprise internal or external threads. Another big advantage to consider is the light weight you get. It also supports allergy sufferers in their buying decision towards a new acrylic tunnel. Since acrylic being such an easy-to-handle material, the resulting colour spectrum of Flesh Tunnel Shop is unmatched. Next to that there are manyfold shaping options like hearts, stars, triangles or gearwheels at Flesh Tunnel Shop. For our lovers of a glamerous style, we?re happy to present you some fine crystal embedded flesh tunnels. Along the line of goods, our ear tunnels in pearl optics are absolutely trendy and a definite eye-catcher. For fans of classical appearances Flesh Tunnel Shop offers various double flare acrylic tunnels.